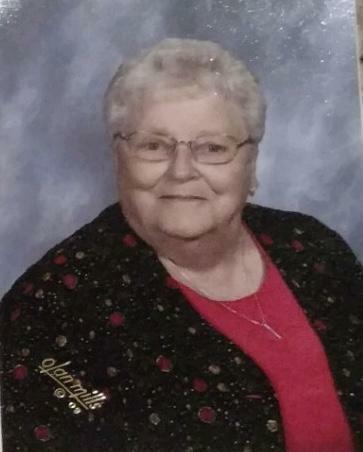 Verona "Joan" West 89, of Curtis, went to be with her Heavenly Father on April 2, 2019 at Kearney, NE. Joan was born one of twin daughters to John and Dorothy Durner of Wellfleet, Nebraska. She attended Bell Prairie grade school and graduated from the Nebraska School of Agriculture. Following a semester of college, she married Truman 'Jake" West of Hayes Center, NE, in December of 1946. Two daughters, Linda (Evans) and Marilyn (Cole) were born and raised on the family farm. She farmed side by side her husband for 19 years before moving to Curtis. She was an administrative assistant to Ernest Nelson of the Farm Bureau, Dr. Everett Stencil of the Medicine Valley Veterinary Hospital and Wayne Heathers at the NRD before retiring. She was a member of the Methodist Church in Curtis, NE. She had a special place in her heart for all farm animals especially the horse's. She loved riding her favorite horse "Twister" with the Frontier Wranglerettes. You might say her farm life continued in Curtis with a very large strawberry patch and vegetable garden. She was proud to display her custom-designed yard art especially at Christmas. Joan enjoyed the days of camping and fishing especially with a pontoon boat. She loved music, played in a band at an early age and love to dance with Jake. The scalding hot coffee was always on at her home or on the boat and you never left her house without eating something. Her Pride and Joy were her grandchildren, watching and cheering them on at rodeos, games or where ever their life lead them. She was preceded in death by her husband, daughter Marilyn, brother Merle Durner, in-laws Truman and Nellie West, sisters-in-law June Bahl and Delores Myers. She is survived by twin sister, Ramona "Jean" Elson, and sister in law Evelyn Durner. Joan's Legacy lives on with daughter Linda, grandchildren, Codi (Greg) Mortell of Susanville, CA, Stacy Cole (Mike) of Lincoln, Kelli (Donnell) Brown of Throckmorton, TX, Kory (Jodi) Evans of Lincoln and Jodi (Ryan) Propst of North Platte. Great Grandchildren, Nathan Mortell, LaMare and Satore King, Tucker( Karley) Brown, Lanham Brown, Jordan (Jacey) Evans and Mason Propst. Visitation will be held at Blase-Wetzel-Strauser Memorial Chapel, Curtis, Nebraska; Monday, April 8, 2019, 3:00 pm - 7:00 pm with the family present from 5:00-700 pm. Funeral services will be held at Curtis Community Center, 301 Garlick Ave, Curtis, NE on Tuesday, April 9, 2019 at 10:30 am with Greg Boller officiating. Burial will follow in the Curtis Cemetery, Curtis, Nebraska.